Hey guys! Ever since I saw the Gelpresso Glow Tint in stores in the beginning of this year, I knew I needed to try them out for you guys! The Gelpresso Glow Tint by Clio is a liptint that gives your lips a vibrant glossy finish and contains lotus extracts to keep your lips moisturize. It encompasses the benefits of using 3 lip products, the pigmentation of a lipstick, the shine of a gloss and the lasting power of a stain. I did a swatch post on the entire range so click here if you are interested. If you have fair skin, this shade will complement your skin tone perfectly. I like using my fingers to blend or even a lip brush whenever I want to achieve a more precise and clean line. If you aren't a fan of a full neon pink lip color, dab on the inner corners of the lips for a softer gradient effect. Do not underestimate the Glow Tint, this product has the texture of a lipgloss but the pigmentation is fantastic. The price is great as well, I got it at for around S$14 after a 20% discount from the original retail price of S$16.90. The product comes in a plastic packaging with a twist to dispense function similar to how a lipstick works. It is pretty easy to control although if too much product gets dispense, there is no going back into the container. The way the applicator is made makes application non streaky and so much more easy to apply. True to Clio's promises, the gelpresso glow tint formula is indeed non-sticky and non-greasy like traditional lip glosses. The lasting power is hands down the best out of all lip products I have ever tried. Clio products are well known for their staying power (especially Lipnicure) and the Gelpresso Glow Tint once again outdone themselves. Once the product is on the lips there is no coming off. The glossy finish disappears after 2hrs of application but the stain will last for an entire day. This product is lacking a bit on the color range. I mean come on, 5 shades! I think Clio can definitely do better in the shade range. Lip products the leaves a stain is ALWAYS drying. I recommend using a balm before application because this stuff will crack your lips. This isn't the most drying lip product I've used (lip stains are the worst!) but it is pretty high on the list. But the great thing about the Glow Tint is it doesn't make the lips look flaky. All in all, the Clio Gelpresso Glow Tint is an amazing product and I highly recommend it. The lasting power is bomb, it is so pigmented, they are so many ways to wear them, all in all, a fantastic product. Hey guys! I haven't updated in like 2 MONTHS! I cannot believe how fast time flew by and I apologize for slacking off. I have been on a very interesting internship for the past 2 months, hence the missing in action. It was rough, but lets save the details for next time, shall we? This post is pretty content heavy so pour yourself a cup of tea and enjoy! Firstly, yes, I did it again. Floral, floral and MOAR FLORAL! It is non-stop floral 365 days in da house yo! Okay calm down hannah. My love for everything floral does not stop even as we enter the fall/winter seasons, and neither should you. And I don't know if you have noticed how colorful my buying habits have been, I think I have been cleared of being a monochrome addict. I will start off with my favourite purchase of the month, this is a BEAUTIFUL dress from Purpur which I believe is a local brand. This is the first time I have purchased from the brand and I am in LOVE with this piece. It is a mini dress covered in a plethora of colored paint strokes. I put on this dress and my mood is heightened up in a snap. It was S$49.90 and it only comes in one size. I adore the high neckline and the cut is just amazing. From JOOP, which is also a local brand, I got a really cute floral lace t-shirt which is oh.my.god SO me. I mean lace and floral, c'mon! It was on sale for S$19.90 and I got the size S. I usually pair this with my leather skirt or skinny jeans for a casual look. From Pull & Bear sale, I got 2 skirts that are made of a neoprene material. They are both pretty short but they are so adorable! 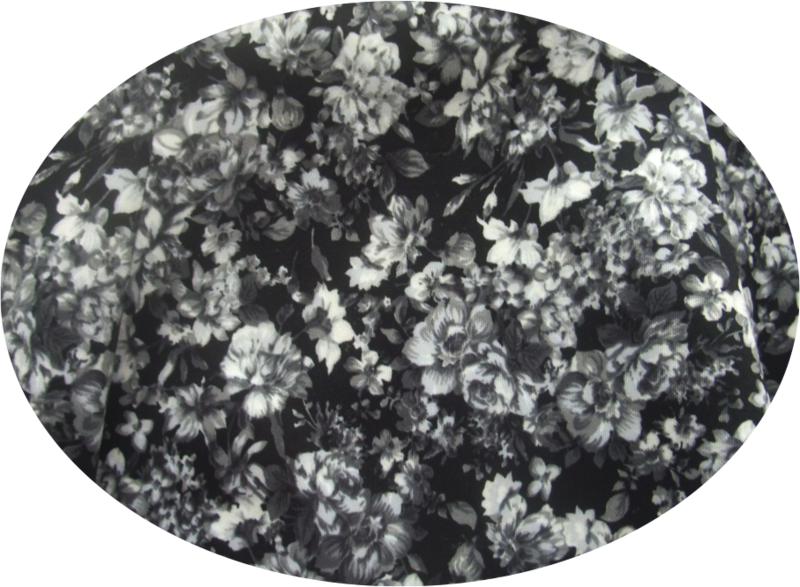 The black skirt has big pleats and the black/white floral skirt is loose at the bottom which creates a flare effect. I am obsessed with the flare bottom skirts, you guys are warned! I think they look so flirty and feminine. Both are S$30 and I believe a size M.
I also got a really cute satin material blouse. I love the frills on the shoulders and it think they look very cute buttoned all the way up. I think they look slightly edgy even, and great for work. They were on sale for S$24. Now this piece is quite an oddity, and a rather random conversational starter. Every time I wore this top, people will comment on it. 'What are these? Bees? Wasps? Houseflies?' To be honest, I would like to know too. The fit is great, very slouchy and baggy. I got this in a sale bin at FEP. It was S$15 and I was like 'why not?' So that is why I got it. Comment down below if you know what it is, why not start a conversation right here. Okay there was a Bysi very near to where I worked at during my internship. There is a stigma of shopping at Bysi, if you live in Singapore, you probably know what I'm talking about. Bysi is a local brand that is more known for selling office clothing, but they have changed their designs a lot in recent years and they carry many zara-inspired pieces. So the piece that I got is a very cute top with a sweetheart neckline, very flattering on broad shoulders and paired with denim shorts will look absolutely adorable. I got it in a UK10 and it was on sale for S$35 reduced from S$70. One of my favourite blogshops in Singapore has to be TracyEinny, I have shopped with them a couple of times and they have an outlet very near where I live so I pop by quite often. They have new collections weekly and I always find something I like. I bought 2 items from them recently, one being a stripe dress and another is black long shirt with a tie string around the waist. The shirt looks amazingly flattering on and both pieces are very appropriate for school/work. I believe they are both S$28 each. This is one of my favourites pieces I got in my haul. If you read my blog for quite some time, you know that I don't own many playsuits, but in recent months I have been really hoarding up all the playsuits I can find. But can you blame me. This one is from Forever21 and look at that beauty! It has a plunge in the front and I'm not too sure if I am comfortable flashing my badonkadonks to the world if I had any. So I will probably wear a bralet under the playsuit. One reason I love it is because it can act as a beach cover up as well. I got this piece in a large because I think it looks great baggier and it was S$25. Another favourite blogshop of mine is Soeurs.co, you've probably heard of them, they are amazing. I love the style of their clothes, the quality is amazing, I am obsessed with them. Soeurs had a 20%off recently and I grabbed the chance to purchase the top that I had my eyes on since they posted the preview. I got it for S$28 after the discount and I love how feminine and poofy the top is without being too overpowering. I got compliments from my friend so I highly recommend buying it. I have been really riding on the high neck trend recently and this is one of the dresses I got from a pushcart at a nearby mall. I personally don't think this type of cutting flatters girls with broad shoulders because it makes them look wider, and unfortunately, I have really wide shoulders. But it was only S$15 so still a great buy if you are a petite lady. That is all guys! If you made it down this far, you da champ gurl! You are officially my favourite person in the whole wide world. 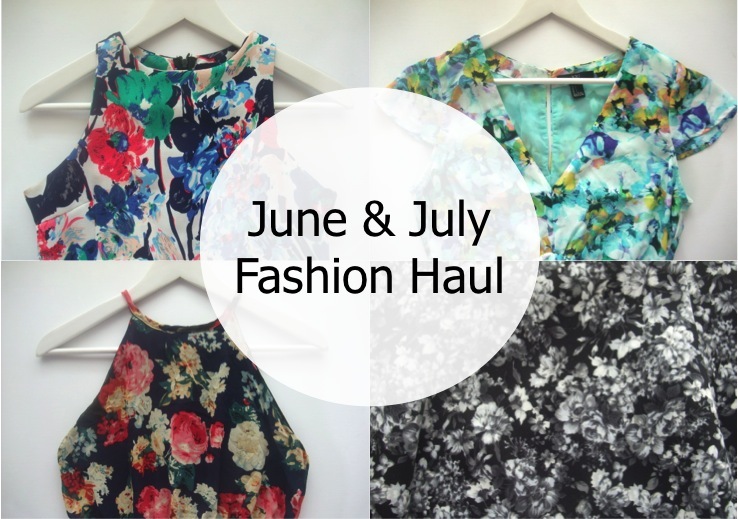 Let me know in the comments below which is your faourite piece and I will see you in my next post! Cheers! 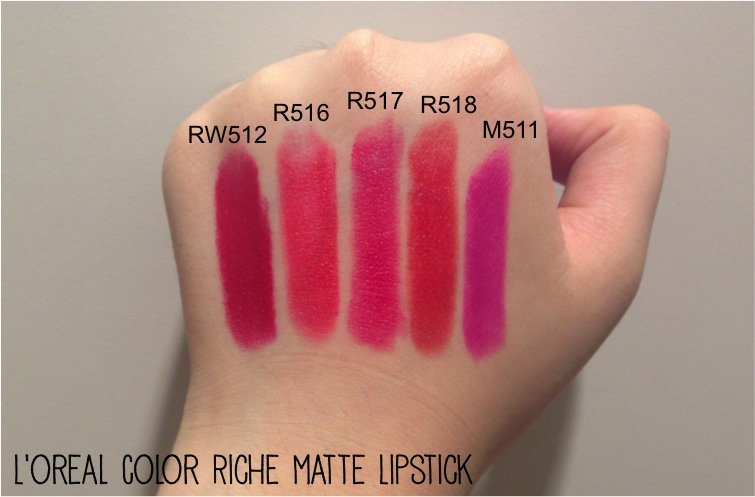 L'oreal Paris Color Riche Moisture Matte Lipstick SWATCHES! L'Oreal's website describes the Color Riche Moisture Matte Lipstick as a lipstick that delivers intense moisture while providing a velvet matte finish. It has a unique formula containing jojoba oil for unrivaled moisture and comfort along with matte gel technology to create an intense matte look. 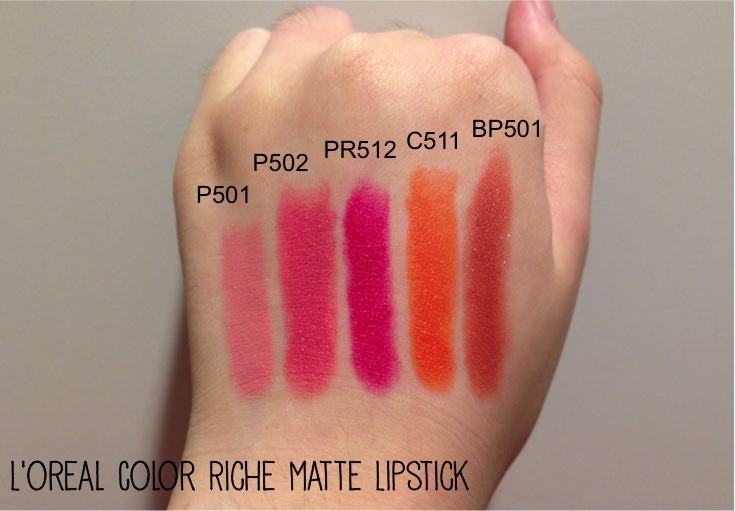 I am blown away by the Color Riche lipstick range. 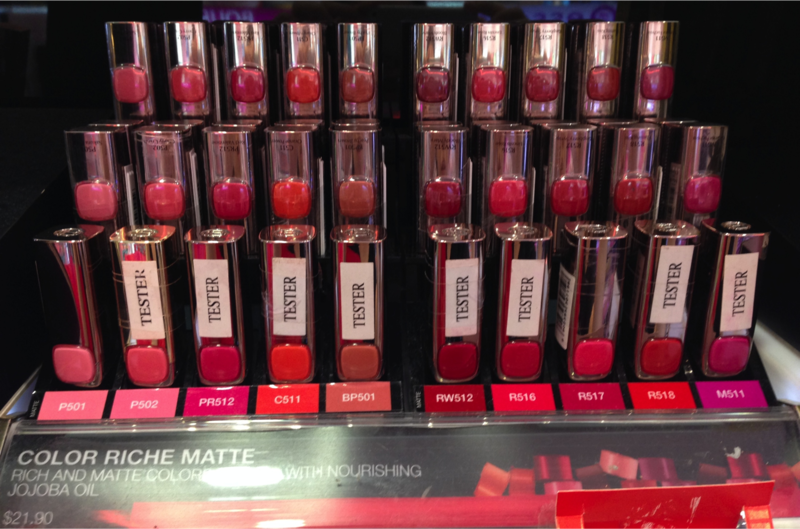 The stores in Singapore carries 10 Colour Riche Moisture Matte lipsticks shades and around 15 Color Riche Lip Color shades. And the the pigmentation is amazing. True to its description, the formula dries to a velvet matte finish. The texture is very creamy and the darker shades leave a stain behind. The design again is very sturdy and has a color code panel on the front for easy identification. They retail for S$21.90 each and are available at Watsons, Guardian, Sasa & major supermarkets and hypermarkets. Hey guys! So following yesterday's post where I showed you guys some stuff I ordered online, I also promised that I will post a little haul today showing some of shoes I got recently. I have been really ill for the past week so do pardon the shorts posts! I always get my flats from Payless. They have great designs in so many different sizes and I can take my time to try them on without I personally love the flexi shoes they have from the brand. They are currently having a promotion of $15 off S$45 bill if you make payment via Visa Debit/Credit card. I thought that was an awesome deal so I got these pair of yellow weave flexi flats and some casual slippers. These yellow flats are S$32.90 and I got it in a size 8. These are the Mel by Melissa Toffee Apple Wedges in Glossy Black. The Toffee Apple wedges are made by recyclable materials. They are very comfortable considering it has a 3 inch heel. I do have an issue with my pair of shoes though, my right pair seems to be almost a size larger than my left pair. I have checked the sizes and both pairs are the same shoe size but the left shoe felt a lot more tighter. They make the legs so slim looking and will look great with anything. The ASOS Suppose Heel is by far, the most flattering pair of sandal mid length heels I have ever tried on. I am a true UK6(EU39) and got it in a UK6. It fits true to size, so perfect I thought maybe these pair of shoes were made just for my feet. The thick, chunky heel makes it a dream to walk in, I think I could even run in these. The hard plastic sole isn't the most comfortable but for the price I really couldn't expect more. *Most of the items have already arrive! I will make another post tomorrow and give you guys a little sneak peek! I wanted to update you guys some of the products I ordered online recently. From ASOS, I ordered a amazing pair of patent chunky kitten heels. I think they are great for work and aren't they adorable? I even had to keep refreshing because they keep getting out of stock in my size. But I managed to cart it in my size (uk 6) in the end which fits me perfectly by the way. And I'm not sure if ASOS changed their check-out policy? Previously there weren't a minimun check-out amount. I was able to get free worldwide delivery on my Rose Foil Jumper which was GBP8 which adds up to around S$16. But when I checked out this time round, I had to hit GBP20 before I was entitled to free worldwide delivery. Maybe because delivery charges are higher for shoes. So I bought the metal bangle bracelet (GBP4.80) which I thought was pretty cute anyways. From Singsale, I purchased a pair of Mel by Melissa Toffee Apple Wedges in glossy black. They looked so cute in pictures and they were on sale for only S$29. I know some departmental stores in Singapore sells Mel by Melissa and they range at least over a hundred bucks. The sizes are a little bit sketchy over at Singsale plus this is my first time buying shoes from that website. It states that it is AU7 which converts to an EU38 and I am usually around a 39 so it will be slightly tighter. 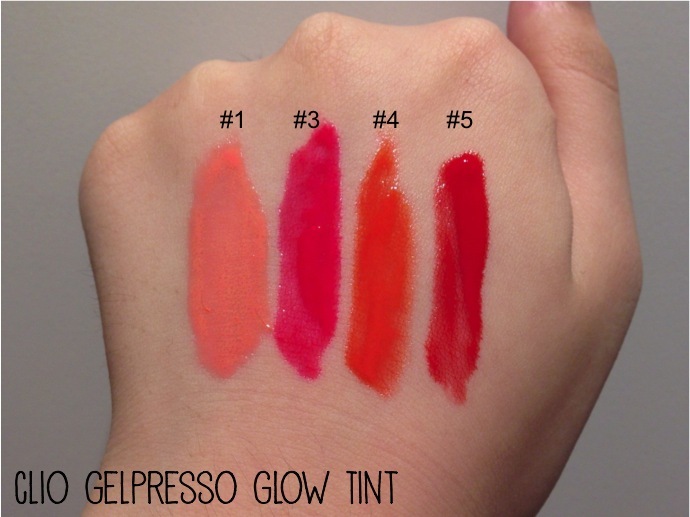 Clio Gelpresso Glow Tint SWATCHES! Hey guys! So nowadays the key term we use in all aspects of life is convenience. Fast food, 2-in-1 shampoo, credit cards has become necessities essential to us. This also applies to makeup; tint for cheeks and lips, tinted moisturizer, gel liner in pencil form, etc are wildly gaining popularity. The 'IT' thing now is none other than 3-in-1 lip products - products that combines a traditional lipstick, stain and lip gloss. Mega impact in minimum time. And the Clio Gelpresso Glow Tint has accomplished that. I feel this is a product has the perfect balance of shine and pigmentation. I love Clio products, I haven't really had the chance to try many of them but they are such a popular brand and are always coming up with innovative unique products like the Virgin Kiss Lipnicure. 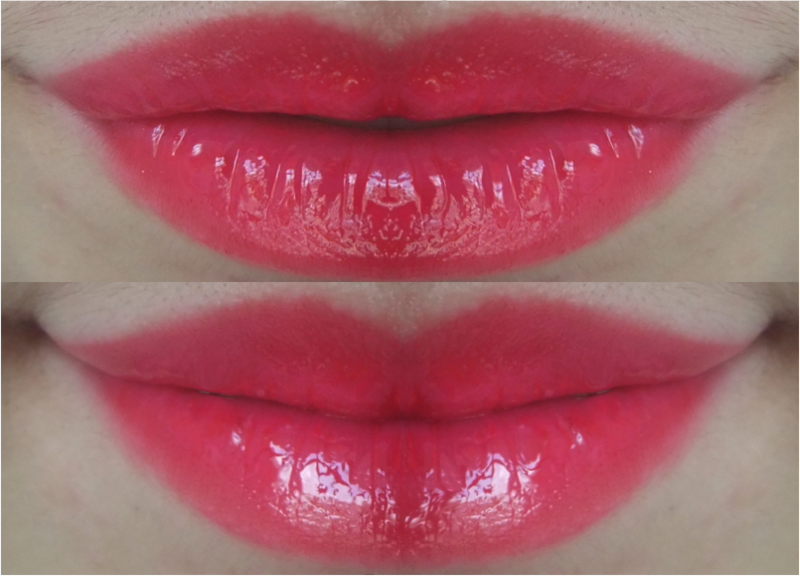 I do have swatches for a couple of Clio lip products, I will leave the links below. The Clio Gelpresso Glow Tint retail for S$16.90 each and are available at selected Watsons. Shade no. 3 looks amazing on fair skin, so I am really tempted to try that. Let me know which shade is your favourite! *EDIT: Review on 003 Enamel Pink is UP! Click here to check it out! Check out more swatches from Clio!